Demonstrators hold signs in front of the U.S. Capitol building during the Justice for All march Saturday in Washington, D.C.
Thousands of demonstrators joined the families of Eric Garner, Michael Brown, Trayvon Martin, Tamir Rice and Akai Gurley on Saturday in Washington, D.C., for the Justice for All march to end police brutality and increase police accountability. Participants made their way down Pennsylvania Avenue from Freedom Plaza to the U.S. Capitol. A coalition of several civil rights groups, led by the Rev. 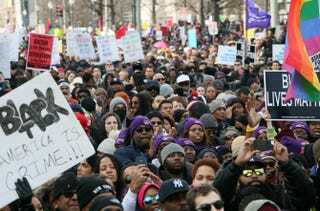 Al Sharpton’s National Action Network, organized the march.